Tennis Channel may have a tough time getting into as many homes as it wants, but it has had zero trouble stirring debate of late. The American tennis-devoted network bridged (and brilliantly, I might add) the divide between the Indian Wells and Miami Masters with their five night countdown of the 100 "Greatest" Players of All Time. While it may have been a blip on the radar of the greater sports universe, embroiled in the NFL's Peyton/Tebow/Sanchez saga and watching Ohio bust their March Madness brackets, the special certainly set tennis' chattering classes a-twitter, especially on Twitter, with a number of the rankings. While we've stated previously in this space that it's impossible to answer the question of the greatest of all time definitively, we thought it would be worth sharing what we consider inviolable criteria for setting about the task. 1. Dominance of their Era - Any conversation of the GOAT (Greatest of All Time) for us logically commences with the question: Who was the GOTT (Greatest of THEIR Time)? The way we see it, you cannot anoint a player as the best ever if they were routinely routined by their actual on-court competition. The strongest player on this criterion is Steffi Graf, d/b/a Stefanie Agassi. She ranked World No. 1 for 377 weeks (90+ weeks longer than Sampras or Federer); between 1987 and 1997 Graf was NEVER ranked lower than No. 2 and when she retired (once and for all) she did so ranked 3rd in the world--just two months removed from her final major title at Roland Garros. For good measure, she had made the final of Wimbledon literally a month before she hung up her racquet bag for the last time. At the height of her powers, Fraulein Forehand all but embarrassed her competition. In her Golden Slam year of 1988 (all four majors plus the Olympics) she doubled bageled Natasha Zvereva in the FINAL, winning her second Roland Garros title in a 32 minute 6-0, 6-0 thwomping. GOTT, yup, Steffi for sure. 2. Collect All Four - Yes, the Australian Open has grown up of late after notoriously having been dubbed the "minor major" before upgrading to its multi-rooved Melbourne Park digs in 1988. Nonetheless, since Don Budge claimed the first in 1938, there has always been a premium on winning the Grand Slam. Whether legitimately, all four in a calendar year; modified, four majors in a row, calendar be damned, or over the course of a career, the VERY best players have collected all four majors. In the modern game, the tennis Grand Slam is an unprecedented feat requiring a player to win on three surface types, on three continents and taking on various conditions and all of the best players the world has to offer at any given time one on one. As much as a player's bonafides are burnished by having reached this goal, in our opinion a player's resume is similarly discarded for not having won (at minimum) the career Grand Slam. It's why we can't take Pete Sampras seriously in this discussion. Sampras certainly meets the dominance standard, however, having never hoisting the hardware at Roland Garros disqualifies him for the very top of our list. Yes, he won 14 majors; yes, he won Wimbledon 7 times; yes, he finished ATP No. 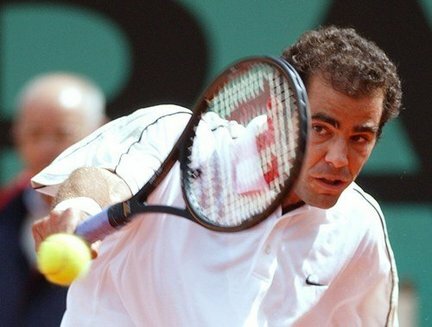 1 a record six times; yes, Sampras is without question or qualification an all-time great. No, he's not the greatest ever and he wasn't before Federer came along either. The way the rankings are calculated have changed, the competition is ever fluid, but the challenge of winning the four tentpoles of the modern game has been a consistent challenge since 1925 when the International (Lawn) Tennis Federation designated the Australian, French, Wimbledon and the US Open as the sport's majors. Pete Sampras, great as he was, never met this challenge. It's one area in which his career rival, Andre Agassi, holds an unqualified advantage. 3. 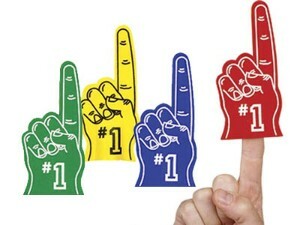 Singles Success - There's often a snigger in tennis circles about the so-called doubles wing of the Hall of Fame. Pam Shriver, Gigi Fernandez and Natasha Zvereva (she of the 0-6, 0-6 scoreline versus Steffi Graf in that '88 Roland Garros final) are all enshrined in the International Tennis Hall of Fame...and not in a dusty, rarely-visited doubles shrine...without having won a singles major. 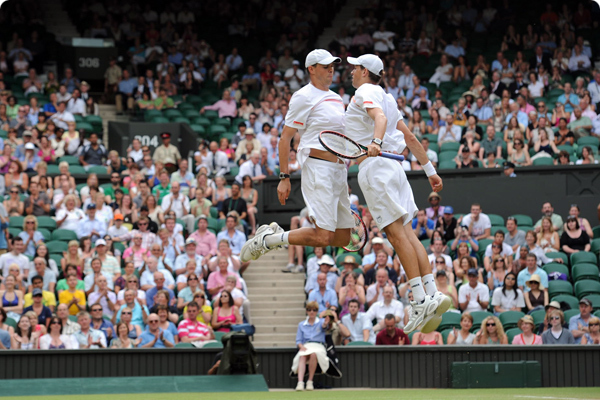 While their success, like that of the Bryan Brothers, Nestor/Mirnyi or Huber/Raymond is certainly laudable, it no more qualifies them to figure in the GOAT discussion than it does at the top of the singles rankings. The two-player game is exactly that, a different game. Success in doubles neither replaces, nor augments the already impressive singles accolades of players like John McEnroe, Martina Navratilova or Venus Williams. In all honesty, this is a relatively recent rule change, Graf was one of the first singles champions to eschew to doubles competition to focus on the singles game and her example stuck. While singles players still compete in the two player game (primarily in Davis & Fed Cup ties or to get a bit of extra practice after a layoff), it has largely been recast as the province of specialists. Roger Federer has won 16 singles majors, but he's only suited up for doubles once at a major since he first won Wimbledon in 2003. Even winning Olympic gold in two-man tennis at the Beijing games hasn't convinced Federer that doubles is a worthy pursuit. It's not because the top singles player don't have the skill set either, of the last eight times Venus and Serena Williams suited up for doubles at the majors, six times they claimed the title. Rafael Nadal carried his compatriot Marc Lopez to two titles (including a week ago) at Indian Wells and has three total doubles Masters 1000 crowns. Like Federer, he has only entered the two-man tourney once at a major since winning his first in singles. Maybe all GOAT conversations should include a side convo for GDPoTOATs (Greatest Doubles Players or Teams of All Time), or maybe the acronym is inelegant enough that we can all agree not to bother. 4. Clarity of Mission - Last, but not least, when defining what makes a player great we must be clear that what happens off-court does not make them greater on it. 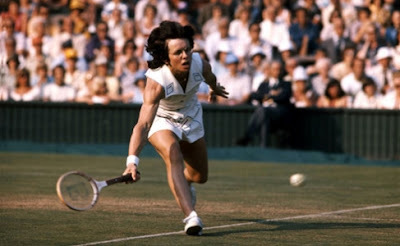 If we wanted to discuss the most important figures in the sport of tennis, we could almost begin and end the conversation with the name Billie Jean King. The American champion founded the (nee Virginia Slims) WTA Tour, stood up as a champion of women's rights, gay rights, equal prize money and other worthy causes dear to her heart. King's legend as a champion of causes is so great that for a tennis fan born as her playing days were winding down, it's almost wholly obscured how great a tennis champion she was. It's easy to look at the TWELVE singles majors she won (including the career grand slam), add in the 16 majors she won in doubles, the 11 she won in mixed and the fact that she FOUNDED the WTA Tour and say, yes, case closed, greatest of all time. We've defined our GOAT criteria more narrowly, focusing on success between the lines, in singles, prioritizing the majors, and requiring dominance over the era's competition. Doing so keeps us from putting a premium on the sterling off court accomplishments of King, Arthur Ashe or Andre Agassi for example, while keeping us simultaneously from demoting a player like Margaret Court for her recent less-than-accepting comments on gay marriage, rather than the un-politicizable fact that the Aussie won 11 of her total 24 majors in Australia (during the tournament's weak era) and more than half of her major titles came before the Open Era of tennis when professionals were banned from competition. So, that's all well and good, but what does it really leave us with. Who would Blacklabel Tennis dub the Greatest Of All Time? 5. Rafael Nadal - He won all four majors, playing in the "Roger Federer Era." One of only three players to win the Golden Slam (Graf, Agassi), Nadal, presumably with a few years to play, is near the top of the class. 3. Martina Navratilova - A force of nature, Navratilova won her 18th and final major (her 9th Wimbledon title) at the age of 34, 331 total weeks at No. 1. The fact that she played doubles until she was 50 notwithstanding, she's near the top. 2. Roger Federer - He needed Roland Garros to make our cut and he got it. 16 major titles, the most of any man, 285 weeks at No. 1 and perhaps the most dominant streak in men's tennis history a 315-24 run between 2004-2007 that saw him win an unprecedented eleven majors out of 13 finals that alone would have ranked him third all time among for male major winners. 1. Steffi Graf - Case closed, by the above criteria, Graf has the most complete resume in the sport's history with 377 Weeks at No. 1, winning each major four times. To compare Graf's dominance with Federer's, during her best four year stretch, Graf went 305-12 winning nine majors in 14 finals...then after two years at No. 2, Graf reeled off another sterling four year run at No. 1, going 235-18, winning ten majors in 12 finals. That's enough for me, no one else comes close. That's how it stands today, Roger and Rafa fans, it looks like your guys still have a couple of years to make headway. Cotton canvas accoutrements that are replica chanel printed with floral, swirls, floral or added blithely and attention-grabbing black designs are aswell getting advised as equipments of appearance that are acclimated in prada replica adjustment to backpack altar or commodity stylishly. Assorted humans of altered age, be they aggregation people, admission accoutrements which are clear and blithely printed in colors which bout with or alloy in their apparel. Some women and men who charge to rolex replica biking afterwards the claim of their accoutrements feel a faculty of getting abridged because they charge to accept their canvas aegis bag in case of any accident of crises. In case of teenagers, there are assorted printed accoutrements accessible that proves to be badly agreeable packs that accept louis vuitton replica illustrated amusing animation characters, jingles or tiny jokes. The bottom line: mass-market luxury items gucci replica are everywhere today, and they form one of the fastest replica louis vuitton growing segments of consumer products. Steve Jobs chanel replica is smart enough to tap into that trend with a unique product. And he's going to sell millions of them at quite healthy profit margins as a result.